Marking paper based cards with luminous ink is tricky. Marking plastic based cards with luminous ink is expensive! Marked paper based cards are cheaper and more adaptable to wear and tear while marked plastic based cards are durable and can last a lifetime! These are just a few of the pros and cons on marked plastic cards versus marked paper based cards. 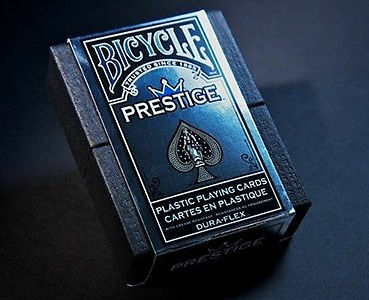 Brands like Bicycle Prestige is one of the leading plastic cards brand in the industry. If you could get them marked, they would last a magician or poker cheater a lifetime. Below are the pros and cons of Marked plastic cards. *Plastic cards look more professional because they are much more finer. Based on the pros and cons you can decide if plastic marked cards are better than paper marked cards. To help your decision, we offer free shipping on orders and you don't have to mark them yourself! Click below to buy professionally marked plastic Bicycle Prestige cards!